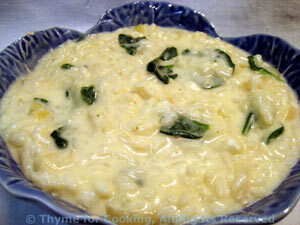 Ricotta Risotto, a luscious, creamy side dish from Thyme for Cooking Kitchen. This is based on a recipe from the cook book 'Risotto'. This is a very white, very creamy, very rich risotto. As always, the end result should be almost soup-like, never stiff. Add the spinach at the end so that it just wilts. Use any leftover in Risotto de Salto. Reserve 1/4 cup to add at the end. Taste the rice. They should be just 'al dente' - slightly resistant to the tooth but fully cooked. You can add a bit of water at this point if needed but you shouldn't have to.